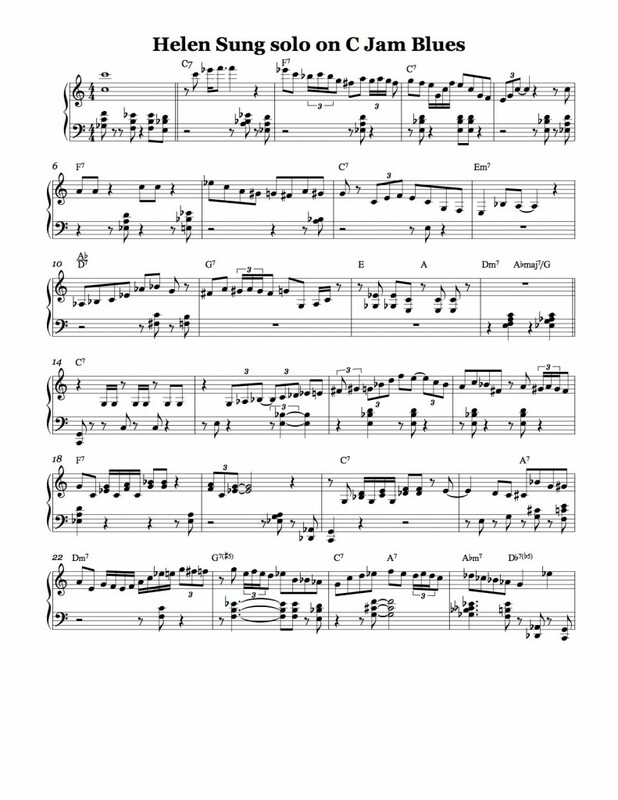 This is the first in a series of posts featuring transcriptions I’ve done of contemporary jazz pianists soloing on the blues progression. Sometimes in the work of contemporary players such as Fred Hersch, Brad Mehldau and Ethan Iverson (who studied with Hersch), it can seem as though the tradition of conversation between left hand chords and right hand melodic phrases in a solo, such as one hears in the solos of players like Wynton Kelly and Horace Silver, is becoming a thing of the past. This thought led me to search through the tundra of modern jazz piano playing for examples of contemporary players using left-hand voicings in a conversational style. I have found that plenty of players still use this approach and manage to sound modern at the same time. Thanks for the comment, Eugene. I agree, Helen is great at playing edgy and modern but in the tradition at the same time. Certainly there are no slouches in the rhythm section. Hey Tom, thanks for this – she sure is swinging hard (with a great rhythm section too). I love her slick juxtaposition of tri-tone subs in mm 10 and 15-16. Nice job on the transcription.